Disabled People South Africa (DPSA) is running a television advertising campaign featuring Noma-India Christabella Zenzile, a woman on a journey with a message for the President of her country. In a country with so many social and welfare problems, the plight of the disabled in South Africa is largely neglected, often ignored. The last scene in the ad is filmed on location at South Africa’s iconic government headquarters, the Union Buildings. 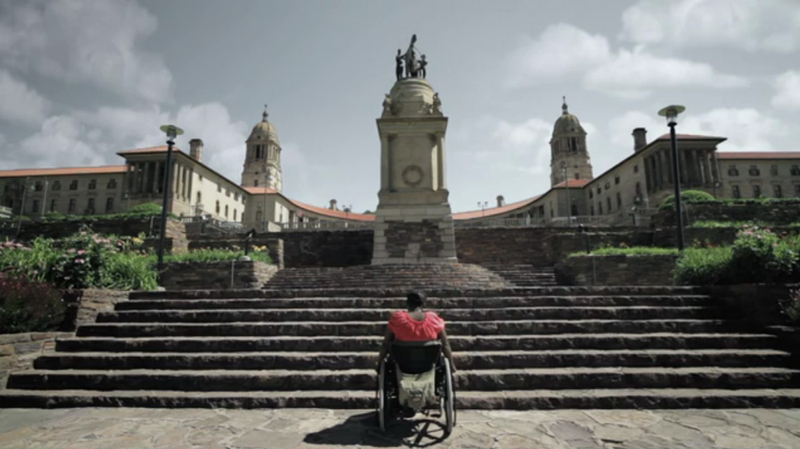 The Accessible campaign was developed at Ogilvy South Africa, Cape Town, by creative director Chris Gotz, art director Justin Enderstein, copywriter Cuanan Cronwright, and agency producer Kamilla Nurock. Filming was shot by director Lee Doig via Let it Rain Films, Cape Town and Johannesburg, with producer Sam Kelly, production manager Justine Solomon, camera assistants James Boon and Nicholas Nyoni, steadicam operator Jo Oosthuisen, focus puller Mieke Chinnery, gaffer Danny Smart, best boy grip Phillip Potgieter, art director Gary Fulton, unit/location manager Karl Schmidt. Post production was done at Priest Post Production by editor Richard Starkey and at Searle Street Post, Cape Town by baselight colorist David Grant and online artist Charmaine Greyling. Music was by composer Richard Vossgatter at Phonograph.